The International Co-ordinating Council of UNESCO’s Man and the Biosphere Programme has added 24 new sites to the World Network of Biosphere Reserves during its meeting in Palembang (Indonesia) from 23 to 28 July. The MAB network now numbers 686 Biosphere Reserves. Two existing biosphere reserves have been extended and had their names changes. “Conserving the biodiversity and the management of natural resources in these ecosystems is a pre-requisite for sustainable development,” declared UNESCO Director-General Audrey Azoulay. “These sites are laboratories of harmonious interaction between people and nature, allowing for advances in the sciences and in traditional knowledge. They facilitate the sharing of knowledge, promote the interaction between science and society and help bring concrete improvements to the lives of local populations,” she added. Biosphere reserves have been designated in Moldova and Mozambique for the first time this year. Also, five sites in Australia, one site in the Netherlands and another in the United States of America have been withdrawn from the World Network of Biosphere Reserves at the request of the States concerned. The withdrawn Australian sites are: Wilson’s Promontory, Hattah Kulkyne and Murray Kulkyne, Yathong, Barkindji and Prince Regent. The USA site that pulled out of the MAB Network is San Dimas Biosphere Reserve and Experimental Forest. Biosphere reserves are sites destined to reconcile the conservation of biodiversity and human activity through the sustainable use of natural resources. One of their objective is to give rise to innovative sustainable development practices. New reserves are designated every year by the International Co-ordinating Council for the programme, a body with a rotating elected membership of 34 UNESCO Member States. Established by UNESCO in the early 1970s, the Man and the Biosphere Programme is an intergovernmental scientific programme that aims to improve relations between people and their natural environment. Arly (Burkina Faso) – Situated in the West African savannah, this biosphere reserve presents a wide variety of natural landscapes including wetlands, gallery forests, dry clear forests, and tree and shrub savannahs. These are natural habitats for vulnerable and endangered species including the cheetah, elephant, lion, leopard and vulture. Agriculture is the main economic activity in Arly with cereal crops (millet and sorghum), peanuts and cotton, alongside livestock. Mount Huangshan (China) – This biosphere reserve is located in the hilly region of Nanling Range in south-east China. It has been a World Heritage site since 1990 and harbours a forest ecosystem almost unchanged since the last glacial period. 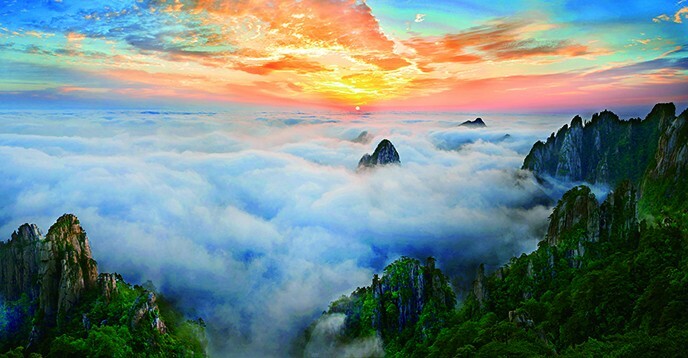 Mount Huangshan has become a sanctuary for many ancient animal and plant species since the Quaternary glacial period. The area thus serves as an important germplasm bank and a hotspot for animal and plant biodiversity. This biosphere reserve is also an important water source for the Xin’An, Qing Yi and Qiupu river systems. Mount Kumgang (Democratic People’s Republic of Korea) – The biosphere reserve is located in the middle of the Great Paektu Mountain Range, in the south-east of the country, and includes adjacent marine areas to the east. Mount Kumgang is a forest-oriented ecosystem linked to coastal, agricultural and freshwater ecosystems. It is home to many endemic and rare species of global significance. The coastal area and natural lakes form the habitats of migratory birds that use the East Asia-Australasian Migratory Pathway. The main economic activities on the site are fishing, agriculture and forestry. Chocу Andino de Pichincha (Ecuador). Situated in north-west of Ecuador, in the province of Pichincha, the biosphere reserve covers an altitudinal range of 360 to 4,480 metres and encompasses the humid moist forest of the Chocу-Darien. The region is considered a biodiversity hotspot hosting some 270 species of mammals, including spectacled bear, Ecuadorian mantled howler and pacarana, alongside endemic species such as the Choco toucan and the Pichincha rocket frog. Approximately 880,000 people inhabit the biosphere reserve. Their main sources of revenue are the cultivation of sugar cane, and fish farming, as well as breeding and trading livestock. Khangchendzonga (India) – Located in the state of Sikkim, bordering Nepal to the west and Tibet (China) to the north-west, this biosphere reserve is one of the highest ecosystems in the world, reaching elevations of 1,220 to 8,586 metres above sea level. The site is one of the world’s 34 biodiversity hotspots. It includes vast natural forests that support high species diversity with high levels of endemism. The main economic activities are agricultural and horticultural crops, animal husbandry, fish, dairy and poultry farming. Berbak-Sembilang (Indonesia) – Located on the south-east coast of Sumatra, this biosphere reserve includes Berbak and Sembilang national parks as well as two wildlife reserves. It contains undisturbed swamp forest peat ecosystems as well as freshwater swamp forests, mangroves and lowland forests surrounding riverbanks with swamps that reach a depth of up to 10 metres. Palm oil plantations, rubber, traditional agriculture (rice fields, dry fields etc) and timber are the main economic activities. Betung Kerihun Danau Sentarum Kapuas Hulu (Indonesia) – Located at the eastern tip of Kalimantan Barat province, on the island of Borneo, the biosphere reserve consists of two national parks, Betung Kerihun and Danau Sentarum. It features unique lowland and mountain tropical rainforests that are home to a great diversity of flora and fauna. Rinjani-Lombok (Indonesia) – The biosphere includes Lombok Island, part of the Lesser Sunda Islands. It consists of relatively flat coastal areas and hilly and mountainous areas. The highest peak is Mount Rinjani, the second highest volcanic mountain in Indonesia (3,726 metres above sea level). It has a very high level of biodiversity, comprising various types of forest vegetation (savannah forest, mountain and lowland rain forest), about 40% of which are primary forests. The inhabitants’ main sources of revenue comes from horticultural (vegetables and fruits), cereal crops (rice), animal husbandry (cows, goats and chickens) and the cultivation of coffee and cacao. Kopet-Dag (Islamic Republic of Iran) – The biosphere reserve covers part of the Kopet-Dag mountain range, along the Islamic Republic of Iran’s border with Turkmenistan. The ecological region of Kopet-Dag is an important part of the Irano-Anatolian biodiversity hotspot, whose primary function is the conservation of many of the endangered species in this area. The main economic activities are agriculture and livestock. Mont Peglia (Italy) – The site is located in the centre of Italy at the confluence of two river systems, the Tiber to the east and Paglia to the west. It consists of an extensive forested area and constitutes an important natural pool of fauna, flora and mushroom species in and around this ancient extinct volcano. These natural resources allow for activities compatible with sustainable development. Val Camonica – Alto Sebino (Italy) – The site is located in the eastern part of Lombardy. The area is characterized by typical alpine and pre-alpine valleys, ranging from valley bottom landscapes to the highest peaks of Europe and the Adamello Glacier, and ends in the Iseo Lake, one of Italy’s largest basins. The landscape features rivers and lakes, woods and forests, glaciers, meadows and prairies. Farming and animal husbandry in the region follows ancestral traditions. Tsimanampesotse – Nosy Ve Androka (Madagascar) – Located in the south-west of the country, this biosphere reserve is a mosaic of terrestrial, coastal and marine ecosystems and is considered a biodiversity hotspot due to vulnerable ecosystems, which include coral reefs, beaches, dunes, sea marshes, mangroves, gallery forest, and littoral forest. The terrestrial part of the biosphere reserve is home to a small number of plant and animal species, whose high rate of endemism reaches 90%. The main economic activities are agriculture, livestock farming and fishing. Lower Prut (Republic of Moldova) – Located in the south of the country, this biosphere reserve encompasses the Prut River and floodplain lakes. Two-thirds of the surface of the area is occupied by Lake Beleu. A wetland area extends along the Prut River, covering a mosaic of water, meadow and forest ecosystems. The main economic activity is agriculture, which provides 90% of the inhabitant’s income. Quirimbas (Mozambique) ­– Located in Cabo Delgado province, in the north of the country, the site consists of 11 islands, a combination of marine parks and a freshwater system including the Montepuez river and Lake Bilibiza, a bird sanctuary. The islands support 3,000 floral species, of which 1,000 are endemic, and a rich fauna that includes 23 species of reptiles, 447 species of birds and 46 species of terrestrial mammals including four of the “big five” (elephant, lion, buffalo and leopard), as well as eight species of marine mammals including whales and dolphins. The main economic activities are fishing, animal husbandry, tourism, arts and crafts and sea transport. Maasheggen (Netherlands) – This agricultural river landscape in the Meuse valley, in the south-eastern part of the Netherlands, has been shaped by continuous interaction between people and nature. The site is used for hay meadows and includes the oldest and largest network of natural hedges in the Netherlands. The landscape comprises a mosaic of small agricultural fields enclosed by hedges, sand dunes, forests, lakes, wet meadows and reed beds. The plan is to use the biosphere reserve as a laboratory for sustainable development and tourism. Charyn Biosphere Reserve (Republic of Kazakhstan) – Situated in the inter-montane basin of Ili, in the southeast of Kazakhstan, this biosphere reserve unites the canyon-like valley of the Charyn river with relict ash forest, deserts and steppes typical of Central Asia. The floristic diversity includes some 1,000 species of higher vascular plants. The fauna is rich and diverse. While agriculture has long been the main economic activity in the region, tourism has been developing for several years alongside cattle breeding and horticulture. Zhongar Biosphere Reserve (Republic of Kazakhstan) – This biosphere reserve is located on the northern slope of the Zhetysu Alataun Ridge and incorporates the entire range of mountain ecosystems characteristic of the Tien Shan mountains and Central Asia. The territory is of global importance as the location of the wild apple gene bank. The main economic sectors are agriculture and the industrial production of sunflower oil, flour and mineral water. Lands are mainly used for grazing and hayfields. Suncheon Biosphere Reserve (Republic of Korea) – Situated on the southern tip of the Korean Peninsula, the biosphere reserve includes the terrestrial ecosystems surrounding Suncheon City (centred on Mount Mohusan and Mount Jogyesan), as well as coastal tidal flat wetland ecosystems in Suncheonman Bay. The site’s rich biological resources include crustaceans, fish and shellfish, as well as medicinal herbs, communities of reeds (Phragmites communis) and East Asian Seepweed (Suaeda japonica). The inhabitants – rural, fishing and mountain-dwelling villagers – utilize ecosystem services in their economic activities, which include rice cultivation, medicinal herbs and fruits such as plums and persimmons. Mountainous Urals (Russian Federation) – Located in the Southern Urals, this biosphere reserve is covered with mixed coniferous and broad-leaved forests as well as mixed coniferous small-leaved forests and mountain taiga spruce-fir forests. Mountain ranges (with summits of 800 m to 1,178 m) and mountain valleys are interconnected by boulder streams. The western part of the reserve is low altitude. While the eastern part alternates between sloping mountain ridge elevations and depressions covered with lakes and deeply incised swampy valleys. About 12,000 people inhabit the site, whose main objective is to transition from extractive industries to a sustainable development model based on biological natural resource management, tourism and the rehabilitation of landscapes scarred by mining. The Mura River (Slovenia) – Located in the eastern part of the country, this biosphere reserve includes the largest preserved complex of floodplains in Slovenia, where the interweaving of natural factors and human presence has created an exceptional cultural riverine landscape. The main sources of income for residents are agriculture, industry, forestry and tourism. Marico (South Africa) – Located in the north of the country, this biosphere reserve comprises a unique freshwater ecosystem which includes the Molemane, Molopo and Marico river systems. The ecosystem is characterized by wetlands and a dolomitic system, which constitute a valuable part of South Africa’s natural heritage. The savannah and grassland areas support vulnerable plant species such as Searsia maricoana. Endemic fauna include 73 species of mammal such as the African elephant, the black rhinoceros and the lion. The main economic activities are subsistence agriculture, livestock, game ranching and tourism. Ponga (Spain) – This remote area of sparsely populated mountains and forests is located on the northern slopes of the Cordillera Cantabrica, in the Asturias. The area is renowned for its steep terrain with altitudes ranging from 213 to 2142 metres above sea level. Deep green valleys climb to vertiginous peaks, passing through extensive beech forests. The majority of the vegetation consists of mixed deciduous woodlands, composed of species such as sycamore, alder, ash, chestnut, oak and hazel. The region contains many animal species, a large number of which are protected, notably the brown bear, the western capercaillie, the grey wolf and golden eagle. Wadi Wurayah (United Arab Emirates) – Situated in the Emirate of Fujairah, the biosphere reserve consists of a water catchment area in an arid climate that is part of the Haiar mountain range. The site hosts a rich fauna and flora endemic to the Arabian Peninsula. It is one of the last Emirati places where traditional farming practices are still maintained. Gombe Masito Ugalla (United Republic of Tanzania) – The biosphere reserve, a major site for Chimpanzee research, includes the Gombe National Park, forest land reserves and part of Lake Tanganyika. Faunal species present in the area include African elephants, ornate frogs and eight primate species. Its flora includes a species discovered in, and named after, Gombe (Pleiotaxis gombensis). The biodiversity of Lake Tanganyika includes over 300 fish species, 250 bird species, and reptiles such as the water cobra and the Tanganyika water snake. Thuringian Forest Biosphere Reserve ­ [extension and renaming, former Vessertal-Thuringe Biosphere Reserve] (Germany) – designated in 1979, this biosphere reserve was extended in 1986 and 1990. Including its new extension, the site now covers 34,000 ha and should provide support for local communities to create a model region for sustainable development. Ticino, Val Grande Verbano Biosphere Reserve [extension and renaming of the former Valle del Ticino Biosphere Reserve] (Italy) – Following its extension, wooded and semi-natural areas of the biosphere reserve designated in 2002 now constitute almost half of the entire site compared to 24% previously. The extension also increases the surface of wetlands and water bodies with the presence of large sub-alpine Insubrian lakes, notably Lake Maggiore and Lake Varese.